Perron, Bernard [to be published in 2013]. Silent Hill: le moteur de la terreur, Questions théoriques, Paris. Perron, Bernard and Mark J.P. Wolf (eds.) [to be published in 2013]. The Companion to Video Game Studies, Routledge, New York. Perron, Bernard (ed.) . Horror Video Games: Essays on the Fusion of Fear and Play, McFarland, Jefferson (N.C). A theoretical analysis of the horror genre in video games. It includes 14 essays that explore the cultural underpinnings of horror's allure for gamers and the evolution of 'survival' themes. 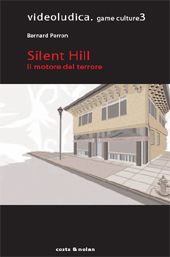 It individually examines the techniques and story effects of specific games such as Resident Evil, Call of Cthulhu, and Silent Hill. Perron, Bernard and Mark J.P. Wolf (eds.) . The Video Game Theory Reader 2, Routledge, New York. The Video Game Theory Reader 2 continues the exploration begun in the first Video Game Theory Reader (Routledge, 2003) with a group of leading scholars turning their attention to a wide variety of theoretical concerns and approaches, examining and raising new issues in the rapidly expanding field of video games studies. The editors’ Introduction picks up where the Introduction in the first Video Game Theory Reader left off, considering the growth of the field and setting challenges for the future. The volume concludes with an appendix presenting over 40 theories and disciplines that can be usefully and insightfully applied to the study of video games. Perron, Bernard and Mark J.P. Wolf (eds.) . The Video Game Theory Reader, Routledge, New York. In the early days of PONG and Pac Man, video games appeared to be little more than an idle pastime. Today, video games make up a $20 billion dollar industry that rivals television and film, and their influence is felt throughout all aspects of popular culture. The Video Game Theory Reader brings together exciting new work on video games as a unique medium and nascent field of study--one that is rapidly developing new modes of understanding and analysis, like film studies in the 1960s and television studies in the 1980s. This pioneering collection addresses the many ways video games are reshaping the face of entertainment and our relationship with technology. In the volume, leading media studies scholars develop new theoretical tools and concepts to study video games. Drawing upon examples from widely popular games ranging from Space Invaders to Final Fantasy and Combat Flight Simulator, the contributors discuss the relationship between video games and other media; the shift from third- to first-person games; gamers and the gaming community; and the important sociological, cultural, industrial, and economic issues that surround gaming. 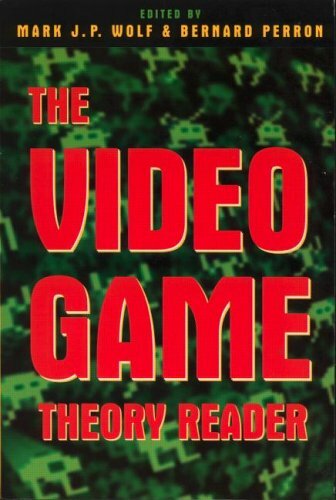 Accompanied by an extensive listing of all gaming consoles developed over thirty years since the birth of the video game in 1972, The Video Game Theory Reader is essential reading for scholars, gaming enthusiasts, and anyone interested in understanding the ever-changing world of digital entertainment. Dor, Simon [to be published in 2013]. "Emulation"; "Strategy", The Routledge Companion to Video Game Studies (M. J. P. Wolf and B. Perron, eds. ), Routledge, New York. Perron, Bernard [to be published in 2013]. "L’attitude de Jacques Henriot", Sciences du jeu.org, No. 1. Picard, Martin [to be published in 2013]. "Levels", The Routledge Companion to Video Game Studies (M. J. P. Wolf and B. Perron, eds. ), Routledge, New York. Picard, Martin [to be published in 2013]. "The Formation of a GLocal Industry: A Brief History of Japanese Video Games", Mechademia 9: Origins (F. Lunning and T. LaMarre, eds. ), Minneapolis, Minnesota University Press. Therrien, Carl [to be published in 2013]. "From the deceptively simple to the pleasurably complex. The rise of the cooperative address in video game design", The Handbook of Digital Games (H. Agius and M. Angelides, eds. ), IEEE Press. Therrien, Carl [to be published in 2013]. "Immersion", The Routledge Companion to Video Game Studies (M. J. P. Wolf and B. Perron, eds. ), Routledge, New York. Therrien, Carl [to be published in 2013]. "Interface", The Johns Hopkins Guide to Digital Media and Textuality (L. Emerson, M.-L. Ryan and B. Robertson, eds. ), The John Hopkins University Press. Arsenault, Dominic [to be published in 2012]. "Qui est-je? Autour de quelques stratégies vidéoludiques de design de personnage pour gérer l’actantialité ludo-narrative du joueur et son immersion fictionnelle", Performeurs, avatars et personnages virtuels : entre performativité et effets de présence (R. Bourassa and L. Poissant, eds. ), Presses de l'Université du Québec, Ste-Foy. Therrien, Carl [to be published in 2012]. "La présence vidéoludique : de l’illusion à la projection dans l’ecosystème affectif de la fiction", Agents, avatars et personnages virtuels : entre effets de présence et performativité (L. Poissant and R. Bourassa, eds. ), Les éditions de l’Université du Québec à Montréal, Montréal. Arsenault, Dominic . 1) "Nintendo Entertainment System" ; 2) "Super Nintendo Entertainment System", Encyclopedia of Video Games: The Culture, Technology, and Art of Gaming (M. J.P. Wolf, ed. ), Greenwood, Santa Barbara, CA. Perron, Bernard . 1) "Roger Caillois", 2) "Joahn Huizinga", 3) "Interactive Movies", 4) "Magic Circle", and 5) "Survival Horror", Encyclopedia of Video Games: The Culture, Technology, and Art of Gaming (M. J.P. Wolf, ed. ), Greenwood, Santa Barbara, CA. Perron, Bernard and Guillaume Roux-Girard . "Entre synchronisation et action: son et violence dans les jeux vidéo d'horreur", Figures de violence (R. Bégin, B. Perron and L. Roy, eds. ), L’Harmattan, Paris. Picard, Martin . 1) "Japan" ; 2) "Art and video games" ; 3) "I, Robot", Encyclopedia of Video Games: The Culture, Technology, and Art of Gaming (sous la direction de M. J. P. Wolf), Greenwood, Santa Barbara, CA. Roux-Girard, Guillaume . 1) "Sound" ; 2) "Metal Gear Series", Encyclopedia of Video Games: The Culture, Technology, and Art of Gaming (M. J. P. Wolf, ed. ), Greenwood, Santa Barbara, CA. Therrien, Carl . 1) "Graphics", 2) "Interfaces", 3) "CD-ROM games", 4) "Pause function", 5) "The 3DO Multiplayer", 6) "Videotopia", 7) "The PC Engine / Turbograf-16", Encyclopedia of Video Games: The Culture, Technology, and Art of Gaming (M. J. P. Wolf, ed. ), Greenwood, Santa Barbara, CA. Therrien, Carl . "Video Games Caught Up In History. Accessibility, Teleological Distortion and Other Methodological Issues", Before the Crash: Early Video Game History (M. J. P. Wolf, ed. ), Detroit: Wayne State University Press, p. 9-29. Dor, Simon . "De la stratégie et de la tactique. La ruse dans les jeux de stratégie en temps réel", La ruse. Entre la règle et la triche (C. Perraton and M. Bonenfant, eds. ), Presses de l’Université du Québec, Montréal, p. 113-130. Roux-Girard, Guillaume . "Listening to Fear: A Study of Sound in Horror Computer Games", Game Sound Technology and Player Interaction: Concepts and Developments (M. Grimshaw, ed. ), IGI Global, Hershey (P.A), p. 192-212. Therrien, Carl . "‘To get help, please press X’. The rise of the assistance paradigm in video game design". Conference Paper from DIGRA Think Design Play, Utrecht School of the Arts, Netherlands. This paper provides a critical overview of the notion of genre in game studies and in the video game industry. Using the concept of genre requires one to acknowledge the recent developments of genre theory in other fields of research; one such development is the contestation of the idea of generic evolution. After a comparative analysis, video game genres are found to differ from literary and film genres precisely on the basis of evolution. The technological imperatives that characterize video game production are also pinpointed as relevant to the establishment and development of video game genres. Evolution is linked to the processes of innovation, and so a model of innovation is laid out from a compare-and-contrast approach to literary and film genre innovation. This model is tested through the history and analysis of the First-Person Shooter genre. This results in new insights for the question of genre in video games, as it is established that genre is rooted not in game mechanics, but in game aesthetics; that is, play-experiences that share a phenomenological and pragmatic quality, regardless of their technical implementation. Perron, Bernard . "The Survival Horror: the Extended Body Genre", Horror Video Games: Essays on the Fusion of Fear and Play (B. Perron, ed. ), McFarland, Jefferson (N.C), p. 121-143. Picard, Martin . "Haunting Backgrounds: Intermediality and Transnationality in Japanese Survival Horror Games", Horror Video Games: Essays on the Fusion of Fear and Play (B. Perron, ed. ), McFarland, Jefferson (N.C), p. 95-120. Roux-Girard, Guillaume . "Plunged Into Darkness: Evolution in the Staging of Fear in the Alone in the Dark Series", Horror Video Games: Essays on the Fusion of Fear and Play (B. Perron, ed. ), McFarland, Jefferson (N.C), p. 145-167. Therrien, Carl . "Games of Fear. A Multi-Faceted Historical Account of the Horror Genre in Video Games", Horror Video Games: Essays on the Fusion of Fear and Play (B. Perron, ed. ), McFarland, Jefferson (N.C), p. 26-45. Arsenault, Dominic and Bernard Perron . "In the Frame of the Magic Cycle: The Circle(s) of Gameplay", The Video Game Theory Reader 2 (B. Perron and M. J.P. Wolf, eds. ), Routledge, New York, p. 109-131. Arsenault, Dominic . "Narratology", The Video Game Theory Reader 2 (B. Perron & M. J.P. Wolf, eds. ), Routledge, New York, p. 369-370. Perron, Bernard et Mark J.P. Wolf . "Appendix – Video Games Through Theories and Discipline: Medecine", The Video Game Theory Reader 2 (sous la direction de B. Perron et M. J.P. Wolf), Routledge, New York, p. 306-307. Picard, Martin . "Art/Aesthetics in Video Games", The Video Game Theory Reader 2 (B. Perron & M. J.P. Wolf, eds. ), Routledge, New York, p. 333-334. Roux-Girard, Guillaume . "Film Studies", The Video Game Theory Reader 2 (B. Perron & M. J.P. Wolf, eds. ), Routledge, New York, p. 349-350. Therrien, Carl . "Reception Studies", The Video Game Theory Reader 2 (B. Perron & M. J.P. Wolf, eds. ), Routledge, New York, p. 380-381. This paper examines the Guitar Hero franchise's ‘simulational’ fidelity in respect to actual guitar-playing. This relationship is often overlooked by many who claim that the game is “not like playing guitar at all”. While there are some significant differences between Guitar Hero and guitar playing, the author takes an in-depth look at the game's controller and interface to argue that these differences are not as important as they may first seem. This paper will argue that game does not perfectly simulate any one dimension of music and guitar playing because it takes another approach toward simulation, favoring breadth over depth. This investigation herein results in a distinction being made between two simulation models for games. Arsenault, Dominic . "Paysages 8-bit. Musicalité et spatialité dans le jeu vidéo des années 1985-1990", Inter, art actuel (Quebec city), Espaces sonores, No. 98, winter, p. 9-12. Picard, Martin . "Video Games and Their Relationship with Other Media", The Video Game Explosion: A History from Pong to PlayStation and Beyond, Mark J.P. Wolf (ed. ), Greenwood Press, Wesport, Conn.
Perron, Bernard . "Présentation. L’entre-jeux : médiations ludiques", Intermédialités (Montreal), Jouer, Bernard Perron (ed. ), No. 9, spring, p. 9-13. As the clash between Game and Narrative rages on, many attempts to unite the two make their way. As heir of this tradition of reconciliation, the Dynamic Range is a tool brought forth to examine how different game systems can give freedom to the players. In its present state, I am going to use it as a compass to pinpoint the close relationship between game design and narratives, and perhaps understand how such a union can be successful. This paper combines several empirical studies and some theoretical research to shed some light on the dark, undefined waters in which we plunge when we are "immersed". Immersion, across all media, comes in three different types and in three different degrees, and can be hindered by barriers, such as inaccessibility, or favored by fuel, such as using one's imagination. The resulting model of immersion can be applied to experiences formed by any type of media object, but is particularly relevant to video games. This paper proposes a tool and methodology for measuring the degree of freedom given to a player in any resource-driven game (that is, any game in which managing resources is an integral part of the gameplay). This concept, which I call the Dynamic Range, can be used namely to evaluate a given game system's potential for developing emergent narratives, as defined by Henry Jenkins in his publication Game Design as Narrative Architecture. While Jenkins places at the heart of the creation of narratives the concept of spatiality, I will argue that narratives can be triggered just as well by a game's very system - the rules that govern that which Janet Murray calls the participatory. Although emotions elicited by the fictional world or the artefact play a part in story-driven video games, they are certainly not the focus of the experience. From a cognitive psychological perspective, this paper studies the appraisal and action dimensions of emotions arising from gameplay. As it relies on cognitive film theories about popular narrative movies, it also revisits their conceptual sources in order to better reflect on the specificity of those gameplay emotions. Blade Runner (1982) est devenu un film-culte à cause de sa représentation futuriste de Los Angeles en 2019. Cela fait évidemment de l'oeuvre de Ridley Scott un paradigme idéal pour réfléchir sur les rapports entre la ville et le cinéma. Mais Blade Runner nous permet peut-être de se pencher davantage sur ces restes urbains qui ont fait l'objet du Colloque de Montréal sur le nouvel art de voir la ville et de faire le cinéma. Car si Los Angeles est devenue la matière même du film, le film est devenu à son tour la texture d'un jeu vidéo en 3D (Studios Westwood, 1997). À travers des notions telles que l'hyperréalité, l'espace virtuel, la navigation, l'immersion et l'interactivité, l'étude comparée du film et du jeu vidéo montre comment l'écran de ce dernier transforme le regard que nous avons sur la ville. This thesis provides an in-depth examination of the nature and application of the concept of genre for the video game. It is divided in three parts. Part one features an overview of genre theory in literature and film studies. The essential properties of genre as a concept are identified: it is an intuitive and “thumbnail” classification method, discursive rather than systemic in nature, and that owes its existence to a common cultural consensus rather than theoretical divisions. More importantly, the notions of tradition, innovation and hybridity are found to be central to genre. In part two, these findings are applied to the case of video game genre. A few typologies are examined to show that authoritative classifications are impossible. A model of the development of genres is laid out, based on three modalities: imitation, reiteration and innovation. By studying the history of the first-person shooter, the traditional conception of genre being based on formal mechanics is replaced by a new definition centered on player experience. Part three details experience as a theoretical concept and places it at the center of a new conception of genre, the pragmatics of generic effects. In this view, any object is a matrix of generic anchors bound to become generic effects, provided the player possesses the generic competences required to recognize them. This new approach is demonstrated through an examination of the survival-horror videogame genre. This case study showcases the potential of the pragmatics of generic effects for other fields, and provides a testimony for the recursion of the questions of genre between the video game, literature, and film. Published: Arsenault, Dominic . 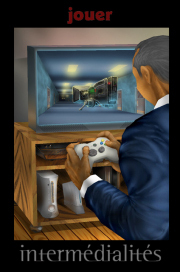 Narration in the Video Game. An Apologia of Interactive Storytelling, and an Apology to Cut-Scene Lovers, VDM Verlag, Saarbrücken. Do video games tell stories? And if they do, how and why do they do so? In this study, Dominic Arsenault takes the reader through the battlefield of ludology and narratology in video game studies, and argues for a radically new narratological conception of the video game. Like a Starcraft Zerg Drone, he extracts ideas from the rich veins of new media and video game studies, along with the latest developments of narratology and French film theory, and morphs them in with his own personal historical insights and gameplay experience with video games and pen-and-paper role-playing games. The resulting theoretical approach finds that narration, as a process, is intrinsic to video game playing, independently of the “cut-scenes” usually much touted by the proponents of interactive storytelling. Academics with an interest in video game studies, narratology or new media will find here a novel perspective on a well-researched subject, while like-minded students and amateur, professional and prospective game developers will also appreciate the quick, efficient and readable introduction to these hot topics. International association of video game studies researchers and developers. Resources (news, papers, references) focused on video game studies. Resources (news, book reviews, references) focused on video game studies. Database dedicated to video games, and particularly to their reviews. Resources (relevant links, references) focused on video game studies. Electronic journal aiming to study video games from aesthetic, cultural and communications perspectives. Website dedicated to video game reviews. Gonzalo Frasca's blog on game studies and video games in particular. Database dedicated to video games, open for community contributions. Electronic version of the Videotopia exposition that retraces video game history.